This continues our series on the new UMBEL portal. UMBEL, the Upper Mapping and Binding Exchange Layer, is an upper ontology of about 28,000 reference concepts and a vocabulary designed for domain ontologies and ontology mapping . This part four discusses structOntology, the online ontology viewing and management tool that is an integral part of the open semantic framework (OSF), the framework that hosts the UMBEL portal. Ontologies are the central governing structure or “brains” of a semantic installation. As provided by the OSF framework, ontologies are also the basis for instructing user interface labels and how the interface behaves. The Web is about global access, immediacy, flexibility and adaptability. Why can’t our use of ontologies be the same? Unlike similar tools of the past, structOntology exists on the same installation as the ontology that drives it. It is a backoffice ontology editing and management tool that is part of the conStruct tool suite, accessible via the OSF admin panel. There is no need to go off to a separate application, make changes, re-import, and then test. structOntology allows all of that to occur locally with the instance in which it resides. Also, there are some important functionality differences — especially finding and selecting stuff and search — that sets structOntology apart from existing, conventional tools. Yet, that being said, structOntology is also not the complete Swiss Army knife for ontology management. It is designed for local and immediate use. Its spectrum of functionality is not as complete as other ontology frameworks (for example, supporting reasoners, consistency testers or plug-ins). So, for immmediate and locally relevant use, structOntology appears to be the appropriate tool. For more detailed ontology work or testing, other frameworks are perhaps more useful. And, in recognition of these roles, structOntology also has robust import and export capabilities that enable these dual local-detailed use scenarios. For these distinctions, see further the structOntology v Protégé? document. structOntology comes in two versions. First, there is the read-only version, which can be made publicly available, that is a great aid to ontology navigation and discovery. This is the version viewable on the UMBEL portal. Second, there is an editable version, which is only available to administrators via a back office function within an OSF instance. Some screen shots of this version, plus pointers to more documentation about it, are provided below. The OWL API is the same engine used by Protégé 4, which is why both structOntology and Protégé are fully interoperable. Besides interoperabilty, the use of the OWL API also means that other OWL API-based tools, such as reasoners or mappers, may be linked into the system. This design is in keeping with our normative view of an ontology tooling landscape, which Structured Dynamics keeps pursuing in a steady, incremental manner . Further, because of its sibling engines, the OWL API and OSF are also able to leverage the other engines supporting structWSF, such as Solr for advanced search or efficient indexing in the RDF triplestore. (The advantages go both ways, too, such as for example enabling the OWL API to feed appropriate ontology specifications to the GATE text processing area for uses such as ontology-based information extraction [OBIE]). All of this makes for a most powerful and capable foundation to an OSF instance. Since UMBEL is a reference ontology and the UMBEL portal is an access point to those references and specifications, we really don’t want casual users making modifications to the ontology . For this reason, only a read-only version of structOntology is provided on the portal. Upon invoking the View option, the hierarchical tree for the selected ontology appears on the left; structural and definitions on the right. Also note that your interaction with the structOntology application is recounted via the “breadcrumbs” listing at the upper left of the application. The green arrow icon allows you to expand or collapse various sections in the display. The editable version of structOntology shares all of the functionality of the read-only version. Besides adding editing capabilities, the editable version also has other functionality related to general ontology creation and management. There is separate documentation for the editable version; the examples below are from a different instance than UMBEL. We’ll highlight some of the differences from the read-only version below. Basic stubbing is provided for the new ontology to help bootstrap its development (not shown). Once created, this new ontology also now appears on the available local ontologies when first invoking the structOntology application. The desired search results then automatically expand the ontology tree. This is really helpful for longer ontologies (the example one shown has about 3000 concepts and about 6000 axioms) and means quicker initial tree loading. Once completed, the (multiple) occurrences of the search item are shown in highlight throughout the tree. Note this search is not necessarily restricted to the actual node label. Alternative labels and descriptions may also be used to find the search results. This greatly expands the findability of the search function. Here is a great example of matching the OWL API engine to Solr underneath a structWSF instance. Each section is editable. All have auto-complete. Each section may also be expanded or collapsed. Most of the key structural relationships in OWL are provided by this panel. (However, note there are some additional and rarely used structural specifications in OWL. These must be set via a third-party external application. 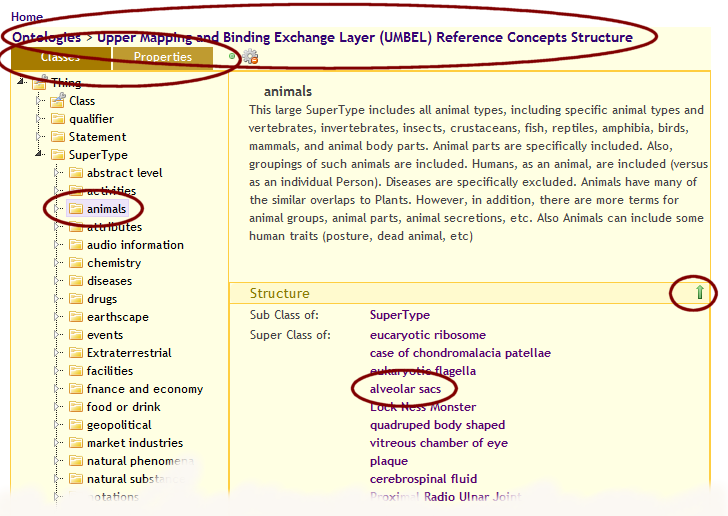 Such potential interactions are made possible via the flexible import and export options with structOntology). As with the prior panels, a new instance may be added or discarded ones deleted. Individual instances and their characteristics may also be updated or changes. The relationship of widgets (or semantic components) to information items is a deserving topic in its own right. 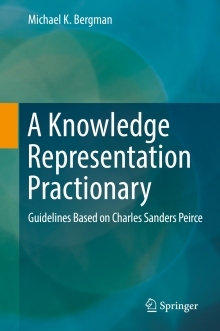 For more information about this topic, see the semantic components category. Export is not active in UMBEL do to the large size of the ontology. If you want to obtain it directly, you may do so from the UMBEL ontology CVS. Via the Import and Export buttons, it is possible to work locally with structOntology while exporting to more capable third-party tools. Then, once use of those tools is complete, Import provides the ability to re-import the updated ontology back into the local collection. Reload — reloads the server version. If prior local work had not been updated, then a reload acts as a way to restore the remote instance to the local one without change.. These are all available via buttons under the main right-hand panel in structOntology and are more fully described in the edit version documentation. UMBEL Services, Part 3: Concept Browser. See further the general Wikipedia description of UMBEL or its specification on the official UMBEL Web site. See especially the second figure and the accompanying discussion in this document. The appropriate pathway for suggested changes to the UMBEL ontology itself is via its official mailing list.